Hi All..... Back in the saddle again after a session of a few family medical problems. ...all sorted out now thankfully. Nothing too serious but very time consuming. I'm trying to catch up with my hobbies now, in fact I've enjoyed learning to play a tenor ukulele...great fun, but I'm just having problems trying to get the latest info and program for the Blue Nickel Club at Scawby....the web site is unavailable, can someone help with some info please? Hi Marshal, good to see you posting again. I play a tenor uke too. Hi Io&m...thanks for the message,..... hope you enjoy the uke as much as I do, it's so handy to carry around and doesn't take up much room on my camping trips. So if you ever pass a campsite and see a lone caravan isolated from the rest it's probably me practicing lol. I've joined a uke club here in Scarborough. We meet once a week to play songs and learn new stuff. It's fun. Maybe you could join a club near you. 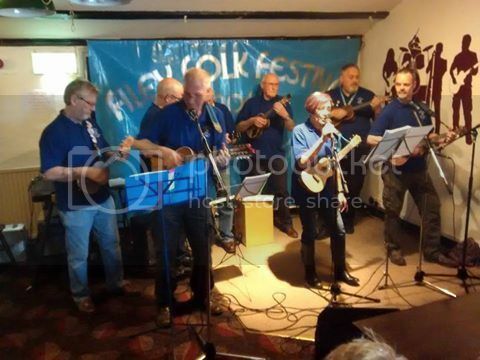 Here's a pic of us playing at this year's Filey folk festival. There's more club members than this but not everyone wants to play out. PS, I'm in the corner. lo&m wrote: I've joined a uke club here in Scarborough. We meet once a week to play songs and learn new stuff. It's fun. Maybe you could join a club near you. Here's a pic of us playing at this year's Filey folk festival. I'm pleased to see quite a few of you are using straps. The club we go along to (not as often as we should) seem to collectively frown on straps!! Nice photo..... I'm mulling over the idea of visiting a club, I live very close to Selby, the nearest one I can find is in York called The Grand Old Uke Of York....the name sounds good eh? I'll have to see if I can rustle up some spare time and see if they will let me visit to get some idea of how things operate there. Most of my spare time is taken up with western renactment and that accounts for most of my bank holidays, other clubs, relating to other hobbies I have, usually have things arranged for bank hols.... anyway I'll see how things go. On the subject of straps, I'd like to have one on my Tenor.... but I'm still trying to figure out how they fit when there's no stud to fasten to........... there will be a way I suppose. Kev, they frown on straps? I thought I knew all the silly controversies in the ukulele world but this is a new one on me. Marshal, The Grand Old Uke of York are awesome. You'll love it. Strap buttons are easy enough to fit if there's a block behind the base. If in doubt take it to your guitar tech. If you bought it online, take it to Red Cow Music on Monkgate.